Love it or dread it, the 14th of February looms near once again… We are all adult-ish here, so we all know that you most definitely do not need a S.O. to reap the joys of Valentine’s Day! Whether or not you’ve made plans for this week, just remember that you can’t love others unless you love yourself first, so be your own secret admirer this week and show yourself some L O V E—you deserve it. FYI: This post contains affiliate links, so we may earn a small commission if you purchase something we recommend. Let’s start with the obvious: wine. 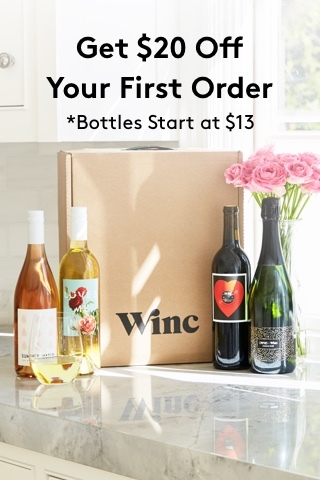 Nothing says “hello me, I love you” like giving yourself the gift of a quarterly wine subscription along with a few extra (full size!) goodies. Is it time to upgrade your perfume? Whether it’s just not your style or your fav scent from high school has been discontinued (RIP, Ralph Lauren HOT ☹️), Scentbird makes picking a new fragrance super fun and simple—you get to pick your perfumes every month, they come in cute, travel-size vials, AND you don’t have to deal with that overwhelming feeling of averting eye contact with the lady behind the perfume counter as you spray 4 different scents on sticks while simultaneously breathing through your nose so you don’t inhale the fumes through your mouth (introverts, amiright?). Let’s just call this what it is—a necessity. I’m not even sure why I’m adding this to the list of “treating” yourself because this is a brilliant piece of art. A blanket that’s stores itself as a pillow? Covered in images of an adorable fur babe? No, my friends, this is not a gift to yourself— this is an investment. Thank me later. Do I (or anyone, really) need another mug? Probs not, but here’s my logic: I follow this goddess of a woman called @shutthekaleup. She’s all about wellness and balance and self-love—all that good ish. She has this mug. And my logic is by owning a mug like hers, I am one step closer to finding my zen. Whoever decided to hold a love holiday in the dead of winter was obviously not thinking of our well-being (could we not commemorate St. Valentine’s beheading in, say, May?!). The amount of exfoliating and scrubbing that some of us have to go through to not look like scaly dragons is a day’s work in of itself, and often times we overlook the most needed area: our lips! Do yourself a favor and make this V-Day a little bit smoother with this delicious (and cruelty-free!) lip kit. Sometimes you want to treat yo’ self but your budget gets in your way of living your best subscription-filled life. If you’re trying to show yourself some love this Valentine’s season without eating tuna and crackers the rest of the month, these luxe slippers should do the trick. There is no way anyone could walk around their home in these and not feel like a million bucks. 9. Shoes. Let’s Get Some Shoes. These shoes are the holy grail of casual comfort. The yoga pants of footwear if you will. They’re sustainable, they’re breathable, and I don’t know quite how to explain it, but they make me feel like summer is right around the corner. Many of us have this dream of a luscious green oasis, but either lack the space or the know how to deal with anything more than artificial plants. Horti has taken the hard part out of plant parenthood and created a curated plant experience to make everyone successful flora aficionado. This haircare company goes above and beyond to give your hair what it needs—their personalization process focuses on intricate details of your environment, your routine, and your current hair and scalp situation. They go as detailed as looking at your zip code to determine smog levels, UV rays and the water hardness in your exact area. Then the personalization gets even more fine-tuned when they start asking about scents and ingredients you want left out of your haircare (side note: all of their products automatically come free of dyes, sulfates, and parabens). These mad scientists are miracle workers! Do something radical and ditch the cliché box of chocolates this year! Just kidding…definitely buy them, but wait until February 15th when they’re on sale. 😉 While you’re waiting on candy prices to drop, try your hand at a more refined confection, like the French Macaron. And if the idea of making your own bougie cookies sounds a bit extra, Amazon’s got you covered. Valentine’s Day is obviously a day of looooove, but let us not forget that it’s not just this mushy happy feeling—it’s painful, it’s entertaining, it’s at times, insufferable and life altering; to simplify this emotion on one level does not do it justice, and Cleo Wade gets that SO loud and clear. The poems and affirmations are a beautiful reminder of the impact and enormity that something as intangible as love can have on our lives. As someone who has admittedly not read for pleasure since Harry Potter, I found myself so enraptured in this book and it was just so relatable and uplifting and readable.